Many of the weekend’s 9/11 memorials chose to mark the anniversary with music. The official commemoration at Ground Zero included performances by Paul Simon (who performed “The Sound of Silence”), James Taylor (who played “You Can Close Your Eyes”), the Brooklyn Youth Chorus and cellist Yo-Yo Ma. Video of those tributes are below. 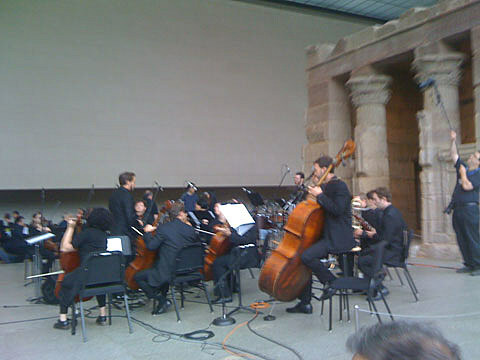 At the Metropolitan Museum of Art, the Wordless Music Orchestra commemorated the anniversary with three pieces of music for string quartet–Ingram Marshall’s “Fog Tropes II,” Osvaldo Golijov’s “Tenebrae” and Alfred Schnittke’s “Collected Songs Where Every Verse Is Filled with Grief”–and the debut of an orchestrated version of William Basinski’s “The Disintegration Loops dpl 1.1.” The musicians played seated at the center of the Temple of Dendur (where St. Vincent recently performed) while the audience faced them and the looming sandstone structures. The afternoon’s second half was dedicated to Basinski’s piece, which has served as a 9/11 elegy since its creation. That relationship will continue: before the start of the program, it was announced that the work would be a permanent fixture at the 9/11 Memorial Museum. The full room listened in reverential silence to Maxim Moston’s live arrangement, which unfolded over a reflective 40 minutes. After the last note died out, conductor Ryan McAdams paused for a several-minutes-long moment of silence, before giving way to a round of applause, which both composer and arranger were in attendance to receive. The entire concert is streaming (with some insightful commentary between pieces) and the live version of “The Disintegration Loops dpl 1.1″ will be available as a limited-time download at NPR Music.